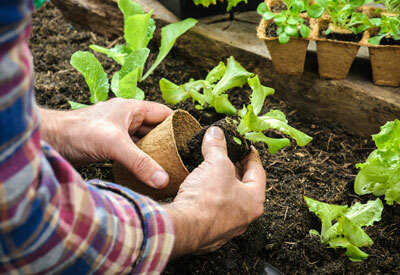 Tips for beginners who want to grow organic vegetables and landscape plants. Starting and maintaining an organic garden is not very different from a regular one. Using common tools and planting processes, you can experience high yields of crops right in your own backyard. Knowing which plants grow best in your particular region and climate can help ensure your garden’s success. Exercising natural pest solutions for gardens can protect the integrity of your crops and your soil’s potential for another productive yield the following year. Read these tips to learn how to get started with your organic garden. When choosing a space to plant your garden, it’s important to select an area that is open, arid, and is exposed to at least 7 hours of sunlight a day. Planting in natural ground has many benefits, including providing the nutrients providing for a great yield. If, however, your soil isn’t in optimal condition or you live in an area with little to no soil, you may try a raised bed or a container garden. You’ll have to do a fair amount of more planning with raised beds and container gardens, because they will likely require more work to maintain optimal conditions for growing plants. With the right gardening supplies growing organically is easy! Planet Natural has everything you need to get started: containers and pots, seeds, soils and fertilizers. Plus natural pest solutions that will guarantee you’ve created the healthiest plants possible. Let’s grow together! Organic gardening is a relatively simple process that uses many of the same supplies that regular gardening requires. If you don’t already have them, purchase a rake, a hoe, compost, mulch, and seeds or seedlings. Other, associated items can help your garden realize its potential. Soaker hoses or drip systems can ensure that your garden’s temperature and moisture levels remain consistent and controlled, increasing the chances that you’ll have a full harvest. Floating row garden covers, neem and horticultural oil can deter particularly insistent pests without the use of poisons. Raised beds can be a viable solution for you if you want to grow plants or crops in otherwise inhospitable conditions or compromised soil. They’re also very common for beginners, and offer a bit of latitude and creativity. If you decide to invest in a raised bed, know that you can create it in any shape that you want. Border the bed with brick, stone or even natural wood to separate it from potential contaminants and make sure that the border is at least 16 inches high to ensure that your garden has protected roots. Once this is done, you can fill the bed with compost to start preparing the area for planting. Despite finding the perfect tract of soil, bed or container, you’ll still have to choose plants or crops that grow best within your region and climate. Find out which plants or crops thrive in your area to experience the highest yield. Consider choosing companion plants to accompany your primary plants or crops. These companions can provide a practical counterpoint to your primary plants or crops, as they can either provide necessary nutrients to help them grow or specialize in repelling pests that would otherwise be attracted to your crops. To determine the best companion plants to include in your garden, research your particular crop. If you are watering your garden by hand instead of relying on a soaker hose or drip system, water your garden in the morning. This can increase the amount of water that your plants or crops retain while also reducing the likelihood of detrimental mildew or mold forming on your crops. For the best crop results, you’ll want to adjust and maintain a soil pH level of about 6.5-7.0. Monitor pest populations. If companion plants don’t repel all of your pests, consider creating your own deterrents, like slug traps. Generally, you should check for pests in your garden at least twice a week. September can be a particularly good month to add compost and manure to your garden. When weeds present, address them as soon as they pop up. While you can use a hoe or other tools to remove them from your garden, hand-picking can be the less invasive and more natural way to rid your garden of these pests. Taking the time to manually pull them out also protects the integrity of your garden, as you’ll be least likely to damage surrounding plants or crops. Check your garden every day for weed sprouts. To help prevent the formation of weeds altogether, consider mulching with organic material that is readily available, such as fallen leaves from your trees or grass from your backyard. June Vegetable Gardening Tips: Penn State’s College of Agricultural Science provides tips for organic gardening during the summer months. September Garden Tips: The University of Nebraska at Lincoln gives some tips for growing plants, fruits, and vegetables during the month of September. Links to tips for other months can be found on the same page. Organic Soil Nutrient Management: The University of Georgia lists a breakdown of all the components that make up good soil for organic farming. Vegetable Gardening Guru: Planet Natural has developed this site to provide tips and answers to many of your gardening questions. Organic Gardening Tips: Here, ways to naturally compost, fertilize and control garden pests are discussed. Gardening Tips: Mulch: The University of California offers advice on the best types of mulch to use in both organic and inorganic farms. Organic Gardening and Pest Control (PDF): The University of Kentucky lists multiple solutions to the problem of pest control in organic gardens here. Crop Production: Georgia Organics gives large-scale farmers tips on how to produce and sustain organic gardens. Organic Gardening Tips (PDF): Weber State University provides some simple organic gardening tips that all gardeners can implement for better plant or crop production. Advanced Gardening Tips: North Carolina State University offers a good overview on advanced gardening techniques. Organic or Not: Tips for Reducing Pest Problems: The University of Illinois suggests natural ways to get rid of common pests in organic gardens.